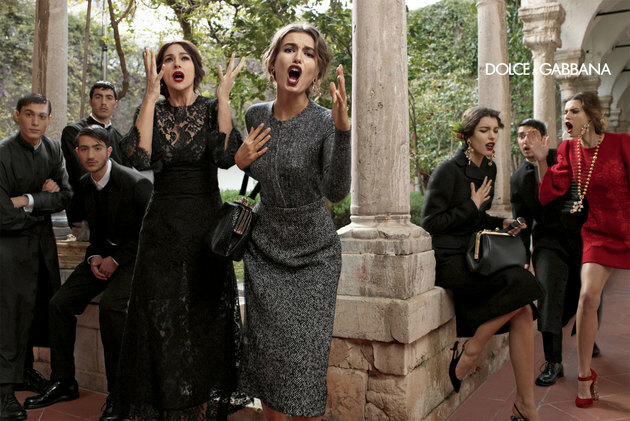 Dolce & Gabbana Campaign for Fall/Winter 2013-2014. The Dolce & Gabbana fall/winter 2013-2014 campaign brings the label's hottest new season ensembles into the spotlight. A true authority when it comes to unveiling new style directions, the label surprised everyone with an opulent Byzantine mosaics inspired fall 2013 collection which instantly became memorable being one of the most representative lines of the Milan Fashion Week fall 2013 edition. But, while the concepts behind the line might be new and unexpected, the same can not be said about the latest Dolce & Gabbana campaign. It seems that as far as advertising goes, the label decided to stay within its comfort zone and opted for the same type of 'family photos'. For the Dolce & Gabbana fall 2013 campaign, the label preferred to work once again with Italian beauties Monica Bellucci and Bianca Balti. Models Andreea Diaconu and Kate King also star in the brand's latest campaign lensed by designer Domenico Dolce. As expected, the new ads have an interesting blend of sophistication, femininity and drama which entices fashionistas to take a second look in order to fully grasp the incredible set of spectacular accents the new looks are defined by. The label's focus was always on classy feminine pieces which are destined to remain in one's wardrobe for plenty of seasons to come as opposed to passing fads and the new Dolce & Gabbana fall/winter 2013-2014 campaign certainly illustrates the concept perfectly. Figure flattering lace dresses defined by the label's signature artistic details are beautifully highlighted in the newest ads by the brand. Gorgeous coats and blazers in versatile dark tones are without a doubt some of the most versatile offerings of the new line. While investment pieces carrying the label's powerful style signature are adequately reflected, the label doesn't neglect the fascinating religion-inspired pieces that set the tone of the line. 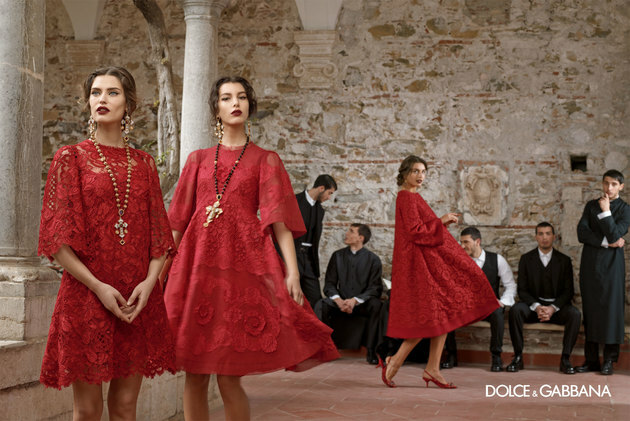 Aside from opulent dresses, the Dolce & Gabbana fall/winter 2013 ad campaign also features over the top accessories like golden crowns, statement earrings or bold necklaces with cross pendants which turn heads instantly.